KMC Tampa Bay is a non-profit organization. Our Center depends upon the donations and generous contributions of our members in order to help us be able to provide the level of service that we would like. Thank you in advance for any help you can provide. By joining a Center Giving Plan of KMC Tampa Bay, you will receive discounts on classes, day courses and special events. In addition, your membership contributions are the main source of income for the Center and help us to maintain and improve our facilities and spiritual programs for the benefit of people throughout the Tampa Bay area and beyond. KMC Tampa Bay’s operating costs (rent, utilities, property maintenance). The flourishing of KMC Tampa Bay (publicity, special events and other education programs). Establishing Dharma Centers throughout Florida and worldwide. There are several levels to choose from. Pick the one that fits you best. Pay for a year up front and receive one month free! $40/month Attend as many GP (General Program) classes as you like at any of our locations in Tampa Bay! Attend the first GP class in a series and receive a free book. Members also receive discounts on special events, half and whole day courses and free retreat sessions. $60/month In addition to all Member benefits, Contributors may also elect to enroll in one of our Foundation Programs*. $75/month Sponsors receive all the Contributor perks and may also elect to enroll in our Teacher Training Program*. 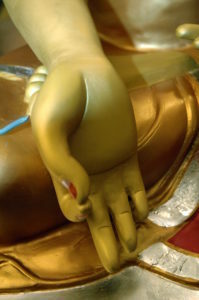 $100/month Our generous Benefactors understand the impact and profundity of Buddha’s teachings. They receive all the same benefits as Sponsors plus free special events, half and whole day courses and retreat sessions. * FP and TTP students commit to join a Monthly Giving Plan. You can participate through the following methods. Pay by check or cash each month. Please call or email admin@MeditationInTampabay.org for more information. Sign up or log in to your existing account and elect a plan by going to Online Store > Contracts.